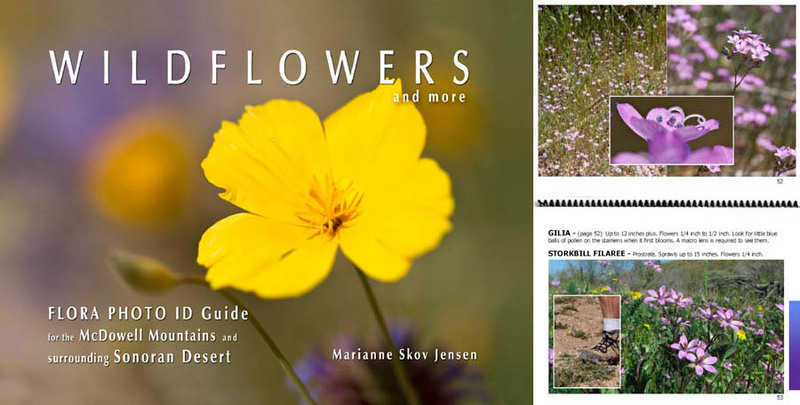 “WILDFLOWERS and more” is a guide to flora in the Sonoran Desert. I created it as a fundraiser for for the McDowell Sonoran Conservancy with 100 percent of my profits going to them. The guide identifies over 150 species of flowering plants, shrubs and trees. Pages are color coded for quick identification and it is spiral bound allowing it to open flat for easy viewing (see photo on right). Each species is represented by up to four photo views showing not only a close-up of the flower but also what the entire plant looks like. At 6.25 X 4.75 inches, it fits in most pockets and easily in your backpack which means you’re likely to carry it with you on your hikes. My hope is the guide will not only be useful in identifying desert flora but will also bring awareness to how precious the Sonoran Desert is. You can now buy from me by sending money through PayPal. Price is $20.00 including shipping.